Just as last year, there will be a variety of interactive activities, demonstrations, dynamic speakers, talented performers, and environmentally-friendly exhibitors, and and non-profits sharing information about living with a lighter, more compassionate footprint including ORC with live birds of prey! We will have a booth set up all day and will be giving a talk on stage in the afternoon. This family-friendly Owl festival is centered around the annual nesting of the local Great Horned Owl the community has affectionately named 'Fiona'. Activities and refreshments will be offered starting at 11AM. We will be presenting a special owl themed presentation from 1-2PM. Join us for an hour long presentation with our education team and education ambassador birds. Join us at Hill Road Library for an hour long presentation with our education team and education ambassador birds. Join us at Wild Birds Unlimited in Thousand Oaks on June 9th! We will have some of our education ambassador birds with us to talk about their species and our shared environment. ORC will have several of our education ambassador birds and a booth set up at Ojai Earth Day. We'll be focusing on education regarding the harmful effects of rodenticide use and Ojai's wildlife after the Thomas Fire. Link to Ojai Earth Day page. Join us for a day of exploration on Santa Cruz Island. For details and to purchase tickets. Click HERE. ***This event is SOLD OUT. Due to overwhelming interest in this trip we will be adding a second date in the near future, so please check back! 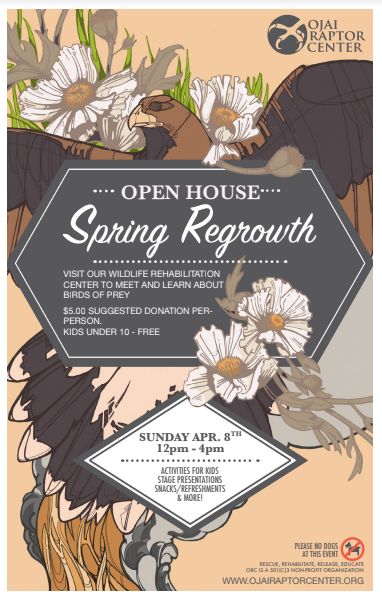 Join us for our annual Spring Open House to meet live birds of prey. We will be discussing nesting and wildlife information post-Thomas fire in our theme booth. We are located at 370 Baldwin Road. In the same complex as Help of Ojai. Look for ORC logo road signage and volunteers to assist in directions and parking. Special thanks to volunteer Kristin Marine for the beautiful design of our flyer. If you are interested in volunteering at Ojai Raptor Center please review our Volunteer Information page to learn more about our program. We'll be holding an orientation to go over the basics of volunteering with us and to answer your questions. *You will not need to bring in an application at this time. You will turn in your completed application upon scheduling your first day with us. We'll be holding a Transporting Orientation for people interested in volunteering through us through transporting. More information on transporting can be found on our Volunteer Information page. Please email ojairaptorcenter@gmail.com with any questions. We'll be putting on our 1 hour education program at EP Foster Library. We'll be at the Grand Opening of Wild Birds Unlimited in Ventura with a few of our education ambassador birds! We'll have our Raptor Booth and Store set up with several of our education ambassadors! More info HERE. Come see us and some of our education birds at Wild Birds Unlimited in Thousand Oaks! We'll be doing our education program at the park with a few of our education ambassador birds. The sixth annual Owl Festival Festival at Olivas Adobe will be on April 23rd from 11-3 PM, a great community event for the whole family. ORC will be there with some of our education ambassadors from 1-2 PM. More information on the Owl Festival Here! We'll have a mini booth and a few of our education ambassadors at this awesome local event. Event link here. WE HOPE YOU'LL JOIN US FOR A FESTIVE FALL OPEN HOUSE. WE'LL HAVE AN OWL THEMED BOOTH AND STAGE PRESENTATIONS FEATURING COOL INFORMATION ON OUR FEATHERED FRIENDS OF THE NIGHT! The ORC booth will be at Ojai Day all day with our live birds of prey and the raptor store! EVENT CANCELLATION- Because of the high volume of intakes we're experiencing, we will be unable to attend Lavender Fest this weekend. We're sorry to miss this great event!